We all need to throw it back to simpler days once in awhile, and last Thursday was one of those days. 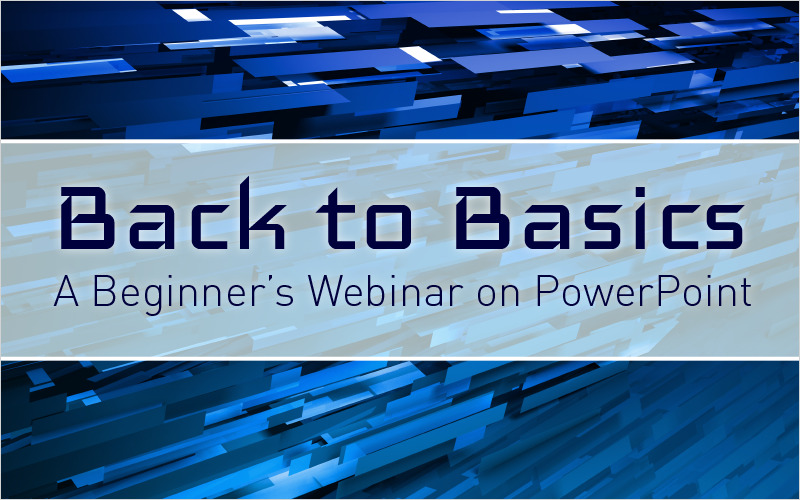 I held a webinar on getting back to the basics of PowerPoint aimed at beginners and pre-beginners to help them get the most out of PowerPoint and jump right in creating awesomely influential and captivating presentations. I started off the webinar by talking about themes and the theme variants that can be applied to your project. I even talked about how you can use the Format Background feature to create your own backgrounds or insert a photo as a background. Next, I talked about layouts and how easy they are to change and apply to the whole presentation or specific slides. I then demonstrated how to create your own text boxes and how to align them to within the canvas to specific objects to create a clean presentation. After that, I demonstrated how to insert and morph shapes to meet specific needs and requisites. I then went into detail on how to use the Merge Shapes feature that allows you to combine two or more shapes in a variety of different ways. Once I finished demonstrating shapes, I talked about charts. I showed how to format charts to fit the needs of the presenter. I then exhibited how to add animations to a chart and then testified to the amount of possibilities that are open to you in regards to animations. Finally, I talked about SmartArt and how you can easily convert boring text into SmartArt. I presented multiple different SmartArt and explained how they improve presentations by giving people a visual representation of text. Keep these tips in mind and always apply these things in your presentations. Comment below if I missed any steps for beginners when creating powerful presentations. Stay tuned for my next webinar in a month’s time!